There aren’t so many good books about otters, which is a shame, because they are the most lovely beasts in creation. If I had to give one reason why there is more to fishing than fishing itself, it is that when someone asks if anyone present has ever seen an otter, I can usually hold my hand up and say I have seen one in the past few weeks. I have twice been within a few feet of an otter, which has taught me the one secret I knew about them until now, which is that their vision isn’t up to much. Thanks to James Williams, I now know that they have a good sense of smell, but their main weapon in their hunt for food is their whiskers, which are so sensitive that even a blind otter can manage to hunt successfully if it knows its territory well enough. The author is uniquely qualified to write about otters, because not only is he chairman of the Somerset Wildlife Trust Otter Group, but is also the Otters and Rivers Project’s officer for the county – and he is a fisherman. His book is an absolute revelation and for once the statement on the dust jacket that the work is based on ‘lifetime’s study’ isn’t hyperbole. For instance, did you know that the average weight of a dog otter is almost exactly the same as that of a badger and roughly double that of a fox? Or that they mark out their fishing rights with spraints and travel about seven miles every night? I can’t think of a book on natural history which I have enjoyed so much in a long while as this one. The author would make a natural Waterlog contributor, not least because anyone who is prepared to devote several pages to the construction of otter loos must be an interesting individual, but there is more to it than bare facts. 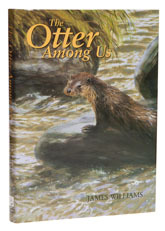 The text is beautifully illustrated by Bruce Pearson and in addition to sections on the otter’s life and habitat, there is a long, diverting discussion on conservation that left me with heightened respect for this unique animal and its struggle to survive. This very fine book was still available direct from Tiercel as of May 2011.